This is part III of Measles week. 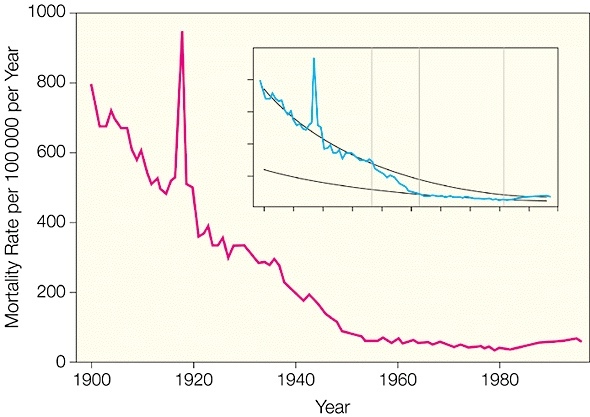 In Part II (“Emerging disease”) I talked about the origin of measles; in Part I (“Introduction”), I posed the question of why measles case-fatality rates dropped so dramatically over the first half of the 20th century (example chart of death rates here). Today I’m going to quickly cover some of the possible explanations that are probably not right; or that, at the least, don’t explain the whole thing. Poor surveillance. 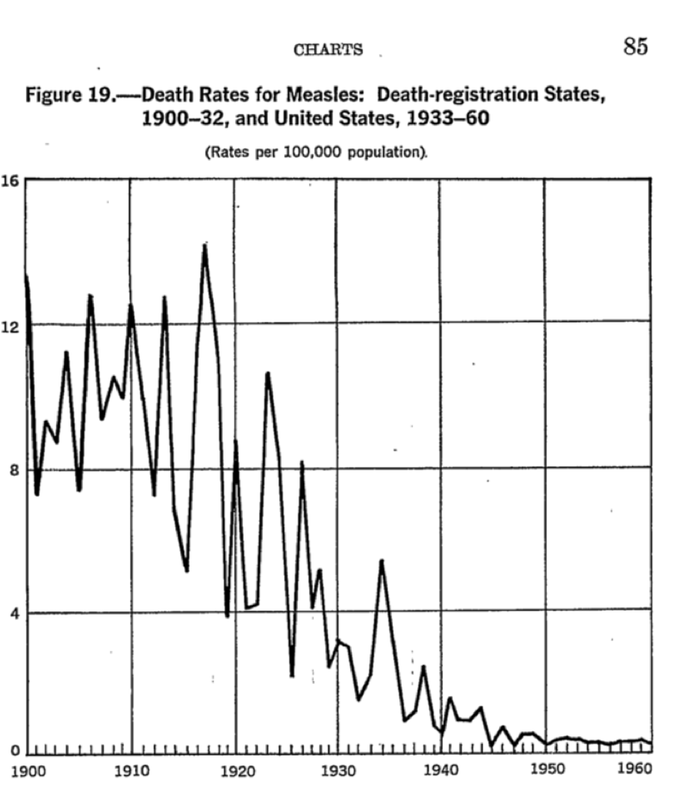 Did the medical establishment gradually, say, lose interest and stop recording measles deaths over the decades? Sanitation. There were huge advances in sanitation, especially in water treatment, in that period. Was that why measles deaths declined? Viral changes. Did the virus mutate and become less lethal in that period? Antiserum. In that time-frame, a new treatment for measles became available. 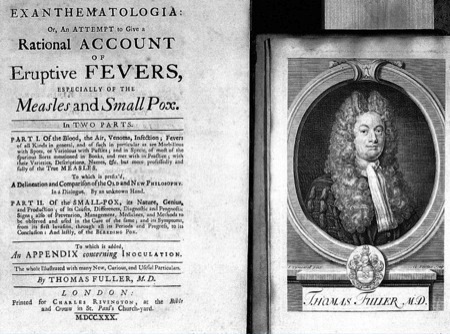 Was antiserum treatment responsible for saving tens of thousands of patients’ lives? And as I noted in Part I, in Britain measles did temporarily stop being a notifiable disease around 1919 — but when official surveillance kicked in again in 1939, measles was still there (chart), with the case-fatality rates right on the same trajectory as before. So the later, lower death rates, which are the unexpected and surprising ones, are the most likely to be accurate. • Sanitation. No one could argue that sanitation isn’t important. But it’s most important for water-borne diseases. Measles is a classic respiratory disease; it doesn’t need water to spread, and sanitation doesn’t stop it from spreading. Of course, we know that the frequency of measles cases didn’t drop, just measles deaths. What about protection against secondary infections after measles infections? That’s more plausible, because by itself, measles doesn’t kill at high frequency; it’s the secondary infections that kick in afterward, in the immune-suppressed and weakened patient, that are fatal. Here, sanitation probably helped some; diarrheal diseases were occasional causes of death after measles infections. But they were far from the most common. Usually, measles patients died of pneumonia. And again, these respiratory infections are the kind that sanitation is less effective in preventing. So sanitation undoubtedly had some effect; it’s probably heavily responsible for the overall reduction in childhood mortality (chart; note the scale compared to the measles charts) during that period. But that background reduction in overall mortality is much less than the effect on measles deaths. So sanitation alone probably isn’t nearly enough to account for the whole reduction in death rates. Part V: What about the vaccine? • Did the virus mutate? Certainly that could happen — there’s precedent for viruses evolving that degree of change in virulence, in that kind of time-frame. But modern measles virus can still kill children at the high rates of the 1910 epidemics, when the infections occur in the Third World. The virus hasn’t (apparently) lost its virulence; it’s the environment of the modern developed nation that lets us survive. (My emphasis) And that fits with the observation that there was not a sudden, abrupt drop in rates in the late 1920s, as antiserum started to be used, but rather a continuous gradual decrease from 1915 to 1955. So there are some possible explanations that, I think, don’t account for a large part of the drop in measles case-fatality rates. Tomorrow I’ll cover some of the answers that are more likely to have had bigger impacts. Sherlock Holmes said something like: Once you rule out what is impossible what remains, no matter how implausible, is the answer. Since you argue that sanitation, treatment and virus didn’t do it then what remains. Those humans who were exposed/survived passed on protection to offspring. Hasn’t worked yet in the third world. I don’t want to call it evolution because of the time frame but perhaps…. tryflyfishing: Evolution of the human population isn’t completely impossible, but it’s really unlikely. We’re talking about maybe 2 generations — after 1000 years with no change in susceptibility. There isn’t enough selection pressure there for that kind of change. historygeek: Yes, I think improved treatment is a part of the story (see my next post, Part IV) but only a part; it’s undoubtedly responsible for a significant improvement in survival, but I don’t think it can account for the huge drop in case-fatality rates that we see. The decrease of mortality is accompanied by a rise in the number of hospitalizations. It seems to support the hypothesis that the decrease in measles mortality stems largely from better access to medical care and improved treatment. “During the 58-year study period, the number of children who died from pneumonia declined by 97 percent” – it’s in the same order of magnitude as the measles mortality decrease. 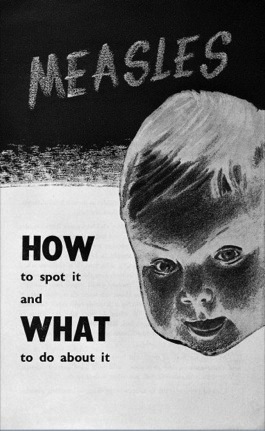 hat_eater – A very interesting reference, but it doesn’t really speak to the measles situation. They describe a decline in pneumonia starting in 1939 (when measles deaths were already hugely reduced from 1915), and emphasize a particularly steep drop after 1966 (nearly 15 years after the measles death rate had plateaued). Also, their explanation for the drop is societal and specific to the USA (the Medicaid program) whereas of course measles deaths dropped in parallel in the US and in Europe generally. I do think changes in treatment were very important, but I don’t think this particular article offers specific support for that. 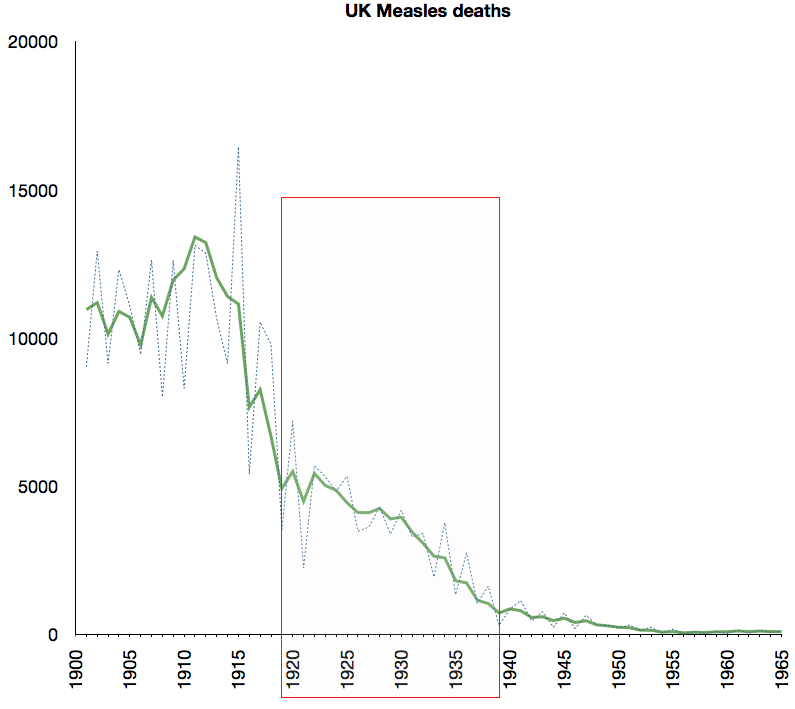 hat_eater – A very interesting reference, but it doesn't really speak to the measles situation. They describe a decline in pneumonia starting in 1939 (when measles deaths were already hugely reduced from 1915), and emphasize a particularly steep drop after 1966 (nearly 15 years after the measles death rate had plateaued). I do think changes in treatment were very important, but I don't think this particular article offers specific support for that.